Oracle VCE – Transportation Mgmt. & Warehouse Mgmt. In the Cloud environment, Brokering will replace the traditional Planning, since software and infrastructure vendors will provide pre-assembled solutions. In newer trends, unlike conventional assembly line solutions development, SW & infra will be pre-configured with rapid deployment options, requiring SaaS integration. In the Cloud era, there will no physical HW or on-premise SW to be maintained. Operations will focus more on preventive detection, especially around service failures. This focused offering is specially designed for organizations that are looking for answers around their JD Edwards roadmap. Led by our senior architects and facilitated through our famous Picasso workshops, this assessment will result in creation of the overall strategy for your JD Edwards landscape for the next 2, 3 or 5 years, including the required details to budget, staff, train and de-risk any business impact. Depending on the required outcome, this assessment can vary in duration from 2 days to 2 weeks. This strategic assistance can be further extended by our SUCCESS EDGE offering, structured around our hands-on experience with 60+ full lifecycle upgrades, implementations or similar JD Edwards initiatives, where we work on behalf of a client in providing customized PMO, Governance, Risk Management, Advisory and Quality Assurance services for their planned JDE project / program. This provides the necessary independent assurance and edge to your program success, executed seamlessly with your internal teams and selected vendors. All of these engagements can be seamlessly merged with our System Selection EDGE offering. Our extensive experience with large customers and large programs around JD Edwards has given us the industry leading expertise to be part of some of the largest Global Rollouts in the JD Edwards industry. 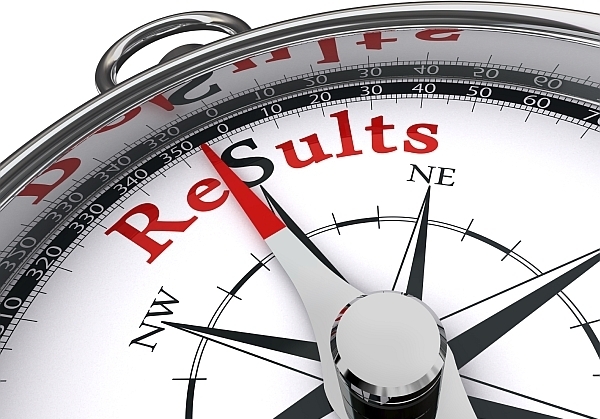 This exposure has perfected our ability to deliver results consistently. In addition, our Results Oriented Methodology (9E-ROM) has been refined from all the lessons learnt from this rich experience. Often misunderstood and misdiagnosed, Global Model Design, Build and Rollout projects have the highest probability of failure, typically because of a roller-coaster and lengthy lifecycle which is unmindful of the market changes and time to value realities of a business. Our unique approach addresses many such critical elements to ensure success of the overall program. In addition, our global delivery capabilities and reach into the various geographies has given us the required knowledge around localizations and country or region specific nuances. Call us to learn more on how we can ensure a successful outcome to your program. Designed around expanding your existing footprint, this area of our services is to assist you in adding new modules and features in & around JD Edwards. Our experts can seamlessly understand your requirements and design & build the right configurations into the system. We offer flexibility in our engagement where few clients leverage our expertise only for the design pieces, while others engage us for the entire lifecycle. Although we are big proponents of keeping a vanilla JD Edwards system, we understand that there are occasions where custom modifications may be justified to meet business requirements. Leveraging our Global Results Center (GRC), we are able to build these extensions or customizations in a timely and cost effective manner. Our Global Delivery Model is designed to enable the same quality as an onsite engagement, but benefit from the cost savings of getting the coding done in offshore. In some situations, we can also deliver the project in a turnkey fashion, where most activities are driven and executed from offshore. We have deep expertise and extensive experience in integrating add-on products and solutions to JD Edwards. Our preferred approach is to use Oracle Fusion Middleware and SOA based integrations, but we also have skills in WebMethods and BizTalk. SUPPORT EDGE – From our pioneering experience in this area, our unique approach to Application Maintenance & Support services (AMS) is centered around JD Edwards. Leveraging our proprietary tools and AMS framework within our Results Oriented Methodology (ROM), we not only provide for corrective and adaptive maintenance but have also matured into delivering preventive diagnostics to result in continuous improvements, operational cost savings and reducing TCO across your application landscape. With our Managed Services for JD Edwards applications (MANAGED EDGE), you can transfer the operational risk of your applications to us, while retaining the headroom you need to innovate and add value to the business. We manage your applications so you can focus on your business. Leveraging our Global Results Center (GRC) and our proprietary tools as Force Multipliers, we can easily adapt to the fluctuating service needs of your business. The benefits usually only available on large engagements are now also available to mid-to-smaller volume clients. BOT EDGE – Our experience in incubating and setting up multiple Offshore Delivery Centers in India, specifically around JD Edwards, allows us to offer a turnkey solution for organizations looking to open their own captive center in India. Inline with our Risk Sharing mindset, we can design flexible options like Build Operate Transfer (BOT), Outsourced Operations and Advisory models. UPK based customized training and education services for JD Edwards. Our trainers are full-fledged field consultants, who coach the participants beyond basic theory and bring real world examples to their teaching techniques. We also offer multi-language training and translation services. 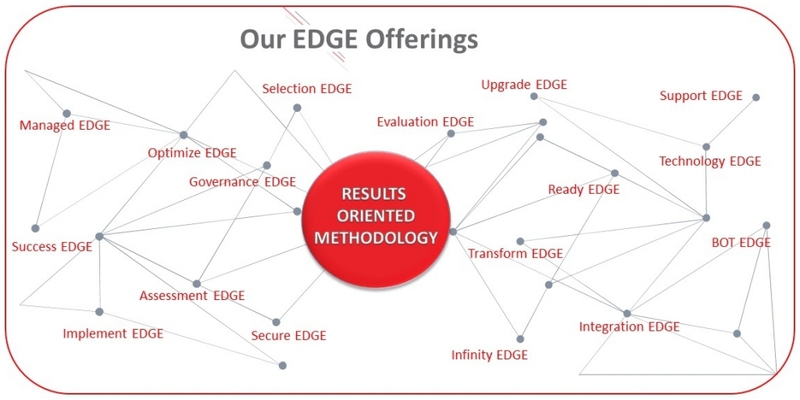 Our SUCCESS EDGE offering is structured around our hands-on experience with 60+ full lifecycle upgrades, implementations or similar JD Edwards initiatives, where we work on behalf of a client in providing customized PMO, Governance, Risk Management, Advisory and Quality Assurance services for a planned or ongoing JDE project / program. This provides the necessary independent assurance and edge to your program success, executed seamlessly with your internal teams and/or existing vendors. Offering flexible models of engagement, we will bring our 22+ years of JD Edwards projects experience to deliver RESULTS to your initiatives. Our Staff-Augmentation and Full-time Employee Placement services are the simplest form of our engagement with a client, where response time and skills fitment matter the most, we are capable of augmenting your staff as a contracting position or full-time employees. As an industry first, we are also open to risk-sharing staffing arrangements, where we go at-risk for a portion of our fees. In addition, we have one of the lowest fees in the industry for full time employee placements, with flexible payment terms. Staffing models can be onsite, onshore or offshore. Try us to experience the difference. packEDGE™ rapidly implements 300+ pre-designed & pre-tested business processes across Financials, Distribution and Manufacturing modules in 3 months or lower if certain processes are not required. Flexible model can incorporate expanded requirements. Includes includes five pre-built forms critical for business and pre-defined security/roles. Also helps in complying to regulated industry needs. We are working on exciting new solutions and products around JD Edwards EnterpriseOne to fulfill key whitespaces in the Oracle ecosystem. Please write to us at info@9EDGE.co if you want to participate in ideation sessions with our Product Development team and/or if you have any co-development opportunities that can be mutually beneficial. 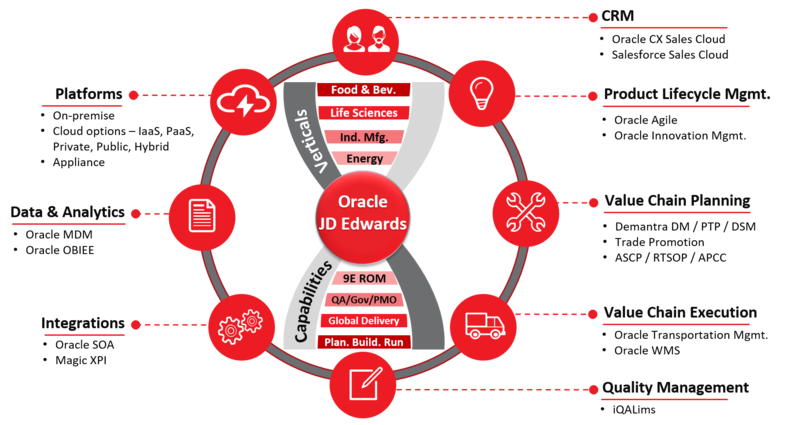 Solutions & Offerings for Oracle | JD Edwards | Cloud ERP | Digital Supply Chain such as upgrade, implementation, global rollout, assessment, roadmap, development etc. for various industry verticals.